There has been a theme to my life this past month, and although I was enthralled by Seth Godin’s Linchpin, which really makes us think about being indispensable in our work lives, in the back of my mind I couldn’t stop thinking about being indispensable for my children. And, it’s not so much that I want them to see me as something they can’t live without (yes, I’ll take that too!) as much as I want to believe…know in my gut…that I’ve done what is within my power to help them develop as Linchpins themselves. I was invited in March to attend an event where Stephen Covey was speaking about how the 7 Habits are now being taught to children as young as 5 years old in schools across the U.S.. 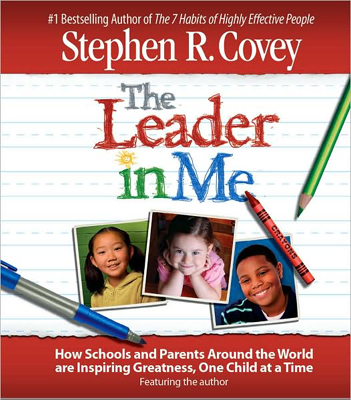 I was not able to make the engagement, but coincidentally, I received an invitation to a webinar about this new movement and the book that describes it– The Leader in Me. Well, I was positively floored with what I heard and saw. And, happy that so many schools are now making it a priority to teach children how to take personal responsibility for their thoughts, actions, feelings, and see themselves as leaders beginning at a young age. Mostly, though, I became motivated to begin this process at home with my children. How do we stop this tape from continuously running in our homes? I now have a thesis I hope to prove that implementing the 7 Habits at home will dramatically help us all to shift out of this type of one-way chatter and into a self-led proactive communication and action model. Cross your fingers (along with me!). I’m going for it. So, for you Mommies (and Daddies!) who want to join me in implementing the 7 Habits at home, this is my Relaxed Book Club topic of the month (maybe not so relaxed this time!). You can find The Leader in Me in book stores, and you can download the Parent’s Guide for less than $5. Here’s to creating the most adorable bunch of Linchpins at home! I hope you will become inspired as well and join me! Monique… the “no more mommy guilt” Mommy! Looking forward to more info – it is never too late to implement good advice, even if your kids are adults! I think yoga helps with this – it makes us feel empowered and healthy and relaxes us which kids can sense. if you are ever in the area, swing by Green Monkey and take a complimentary class and try to take home the relaxed feeling of yoga! (mention Danielle and they will let you in as guest)! would love to get in touch with you to give you information about our kids yoga program as well! Danielle, thanks so much for your perspective and sharing about Green Monkey! My kids have actually given Yoga a try with me at home, and we’ll definitely take you up on your offer to stop by and try it out. I’d also enjoy receiving more info about your kids program. You can email me at: enpointecoach@gmail.com. What a great idea. I’ll have to check this out for myself. I’m on board for the book club..just alert me when it’s up for discussion. Hi Liza! I hope you’re enjoying your new venture!! Hopefully, I, as well as other parents who may trying along with me, will experience the benefits stated in this book so far. My first post re: The Leader in Me should be up by Monday, so I hope to begin a great discussion at that point. Wishing you much success…Mo! « What’s dying to be born?